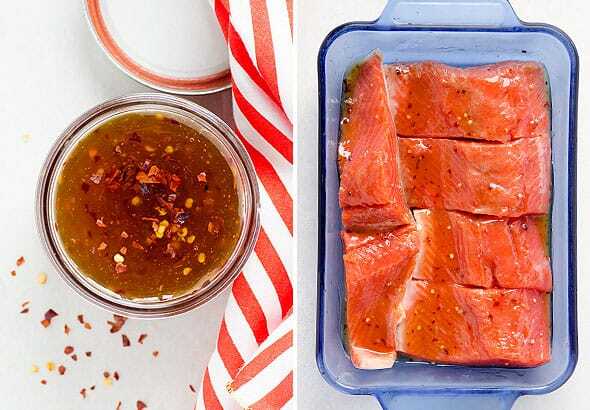 Ever since we went 90% organic, we are more aware of GMOs and coming up with a homemade version of Thai Sweet Chili Sauce was a must to keep enjoying our Thai baked salmon recipe. That sauce can be refrigerated for months and you can use it in so many other Thai dishes or simply with grilled chicken. If you are a fan of Thai Kitchen sauce, you gotta try mine – exact copy but healthier. In our household we eat a lot of wild sockeye salmon – good quality fish with healthy Omega 3s that is affordable in Pacific Northwest. I highly suggest you stay away from farmed salmon! 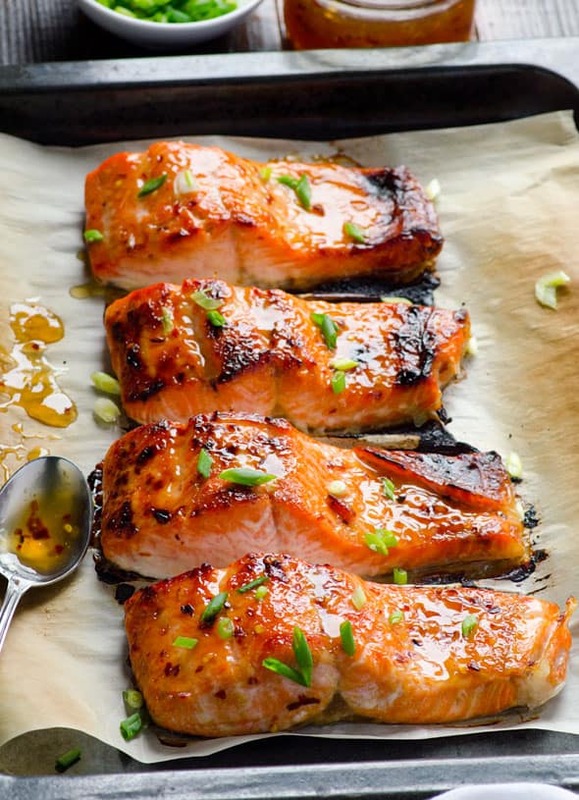 Atlantic salmon is farmed salmon, don’t be fooled by its name. It is artificially coloured, fed antibiotics and is exposed to pesticides, high in unhealthy Omega 6s and is a devastation for wild marine life. In a large baking dish, lay down salmon fillets in a row. Each fillet – sprinkle with a pinch of salt and top with 1 tbsp Thai sweet chili sauce. Brush or rub with your fingers to coat fish with sauce evenly on top, bottom and sides. Cover and let marinate in the fridge for at least 2 hours or overnight is the best (up to 24 hours). Turn on oven’s broiler on High and position top oven rack 5″ – 6″ below the heat source. Line large baking sheet with unbleached parchment paper, spray with cooking spray and place salmon fillets skin side down (if any). Coat with remaining marinade from the dish (if any). Broil for 8 minutes, rotating baking sheet once. Remove from the oven and brush top of each fillet with 2 tsp of Thai sweet chili sauce. 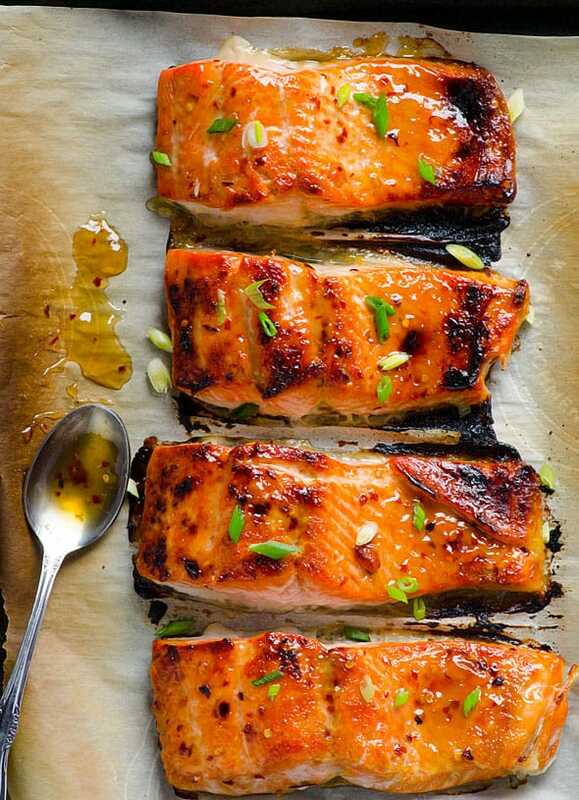 Return to the oven and broil for another 5 minutes or until salmon has caramelized. Serve hot garnished with green onions, extra sauce (if desired) with brown rice or quinoa on a side.